While police reports aren't generally admissible in court, they can provide valuable information to an accident victim's attorney or insurance company. Getting a copy of a police report after a car crash is usually as simple as contacting the law enforcement agency that investigated the accident, completing a form and paying a small administrative fee. However, municipal police departments, sheriff's offices, and California Highway Patrol all respond to accidents, which may make it difficult for accident victims to remember which agency responded. Fortunately, where the accident occurred can offer a clue: victims injured in accidents that occurred in cities such as Rancho Cucamonga, San Bernadino, Victorville, and Fontana should contact that municipal police department. While victims injured in accidents that occurred outside the city limits should contact the San Bernadino County Sheriff or the California Highway Patrol. Were You Injured in an Accident in California? If you were injured in an accident caused by another driver or entity's negligence, you may be entitled to compensation for damages. 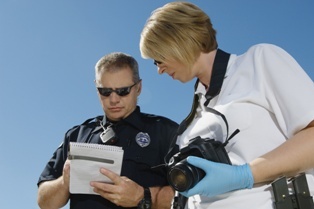 A copy of the car accident police report can give your attorney the information they need to build a strong case. Contact the Inland Empire Law Group today at (888) 694-3529 to schedule an appointment for a free initial case consultation.